Folding cloth diapers is quite simple once you have a little bit of practice. 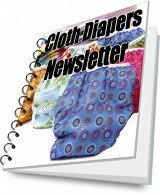 These four basic cloth diaper folds are all you really need to know. Keep in mind, these instructions for folding cloth diapers apply to prefold diapers. 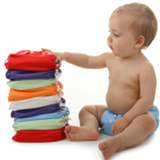 If you use most other types of cloth diapering systems, there will be no folding required. Before you even start folding your cloth diapers, be sure to have all of your supplies within arm's reach, and ensure your baby is on a safe surface. Although I have a perfectly good change table, I like to change my son on the floor of his nursery. It gives us a little more room to manoeuvre, and he's extremely squirmy, so I know he's not going to fall when he's on the floor. Some instructions for folding cloth diapers have you lay the baby on the unfolded diaper with the top edge of the diaper at the small of his or her back, and proceed to fold the diaper that way. This approach will help you to gauge exactly where to fold to get a good fit for your baby, but it requires a cooperative baby who isn't squirmy. Other instructions for diaper folding have you fold the diaper first, lay it on top of the diaper cover, then put the whole thing under your baby. This is the approach I take, because my son won't sit still for more than a couple of seconds. You should use whichever approach works best for you and your baby. If you use pins to fasten your diapers, consider keeping them open and stuck in a bar of soap. 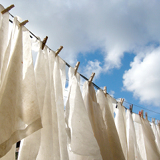 That way they are safely stored, and the soap will help them slip through the fabric more easily. Be sure to pin through a few, but not all layers of the fabric. Also, never hold pins in your mouth while putting on a diaper. At times you may wish you had a third hand, but holding pins in your mouth while arranging your baby's diaper can teach your baby that it's okay to put the pins in his or her mouth - definitely not something you want your baby to learn. Folding cloth diapers does not have to be complicated at all. There are only four basic diaper folds (with a couple of extra variations that some people use). You don't even have to be an expert on all of the folds. Most people find one that works, and they stick with that fold most of the time. Keep in mind that, in general, girls need more absorption in the back of the diaper, while boys need more absorption in the front. This can be a factor when deciding which diaper fold will work best for your baby. No matter what diaper fold you use, ensure that none of the prefold is peeking out from the cover. If any of the prefold is sticking out, there is a very good chance your diaper will leak. Snappis are not necessary, but they can be helpful. A Snappi or diaper pins can help prevent your prefolds from shifting, but a well fitted, snug diaper cover will do the same job for many babies. Again, this is a situation where you'll want to experiment a bit and see what works best for you and your baby.